The spotted python (Antaresia maculosa) is a non-venomous python species found in northern regions of Australia. 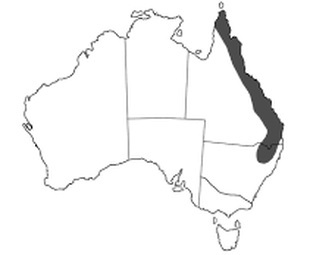 ​Their distribution encompasses the north-east to eastern coast of Australia, from the extreme north of the Cape York Peninsula extending south through eastern Queensland to northern parts of New South Wales. They are also found on many islands off the coast of Queensland. The spotted python favorite habitats range from dry woodlands to wet forests, river banks, and rocky areas. They are particularly fond of caves, where bats take refuge, since they are among their favorite prey, catching them at the entrance of their caves. The spotted python is an agile climber and although they won't climb larger trees, they are often seen climbing small shrubs or rock faces. They have very few predators as adults. The spotted python brumates (a kind of hibernation) during the cold winter months. ​The species is also known by other common names, like the Eastern Small Blotched Python. The species is the largest member of the Antaresia genus and at the present time, there are no subspecies currently recognized.​ They are sometimes mistaken for juvenile Children's Pythons (Antaresia childreni). The spotted python is one of the smallest python species, growing on average about 39 to 55 inches (100–140 cm) in length and weigh around 2 to 3 pounds. Not anywhere near their cousin the massive reticulated python. Their characteristic ‘spots’ are really only blotches of dark brown on a light brown background. On occasion, these spots join together and look almost like stripes, particularly near the head and tail. The head is distinct from the neck and their underside is mostly cream in color. Regarding its small size and lack of venom, docile nature and even temperament, they rarely present any problems when properly maintained. Although some juvenile snakes can be a bit more snappy, in most cases the species makes an ideal first pet snake for just about anyone. This makes the spotted python is a very popular pet among both American and Australian reptile enthusiasts, and are affectionately known as 'Macs' a short for 'maculosus'. ​With proper care, spotted pythons can live 15 to 20 years in captivity on average, in the wild it should be substantially less. The species was described in 1873 by the German naturalist and explorer Karl H. Peters. The Spotted Python (A. maculosa) was until recently grouped with both the Children's Python (A. childreni) and Stimson's Python (A. stimsoni) in a single species. They are still often grouped together as "Children's Pythons", "Children's Python's Complex" or the "Children's Python's group" in both the literature and the exotic pet trade. In 2003 a new subspecies was described by Hoser A. m. brentonoloughlini, based on specimens found in the Cape York Peninsula, with a much lighter base color and an average length about 10 cm longer. ​However, this wasn't considered valid by other herpetologists and no subspecies of spotted python (Antaresia maculosa) are currently recognized. They are the largest member of the genus Antaresia. The spotted python is a nocturnal species, which will actively seek their prey. Younger spotted pythons feed mostly on small lizards. As these snakes get bigger they start feeding on bats and other small mammals but also other reptiles and even birds. They have heat-sensing pits on some of the lower labial scales, these pits are comparable to those found on pit vipers and help them hunt down their warm-blooded prey, such as mammals and birds. Like all pythons, they are non-venomous snakes that kill their prey by means of constriction, coiling around their prey and squeezing until it dies of suffocation or the heart stops beating. The digestion of they will depend on prey size and ambient temperature, ranging from a few days to a month. The spotted python is an oviparous species, females lay eggs. The female lays on average 10 eggs per clutch. Much like other python species such as the Burmese python, spotted python females incubate the eggs by coiling around them and shivering to increase the temperature. After an incubation period of about 80 days, the eggs hatch. The hatchlings tear open the eggs leathery shell. Waiting up to 2 days until all of them are ready. The young snakes them leave the nest all at once, this is quite a sight! The spotted python is not listed on the IUCN Red List of Threatened Species. The species is however listed on Appendix II of CITES, and the international trade of this species is controlled under this convention. The main threat to the spotted python is habitat loss, fragmentation, and degradation. Also, predation by introduced species like foxes and cats contributes to their declining population. The inland taipan bite contains venom enough to kill up to 100 full grown men.